The way dental implants are used today for teeth restoration may seem revolutionary, but the history of this treatment is longer than you might think. Take a closer look at the history of implant dentistry here. The first known instance of a rudimentary dental implant being is over 4,000 years ago in ancient China. There, bamboo pegs were carved in the shape of teeth and put in the mouth to replace missing teeth. About 3,000 years ago, an Egyptian king used a copper peg to replace a missing tooth, although it is not known if the peg was placed before or after death. Over 2,000 years ago, there is evidence that people used animal teeth and teeth that were taken from the poor and from slaves to create an implant, although this practice likely caused severe infection. Ancient skulls have also been uncovered that appear to show some attempts at tooth replacement using a variety of materials, from shells to jade. In 1886, a breakthrough in implant dentistry occurred, when doctors realized that the reason their patients often rejected in implants is that the implant had to fuse with the bone to be successful. This process is called osseointegration and forms the foundation of modern implant dentistry. In 1952, it was discovered that titanium fused more closely with bone than other metals, and in 1965, the first titanium implant was used in a human patient. Today, dental implants are considered to be the most natural, effective form of tooth restoration. 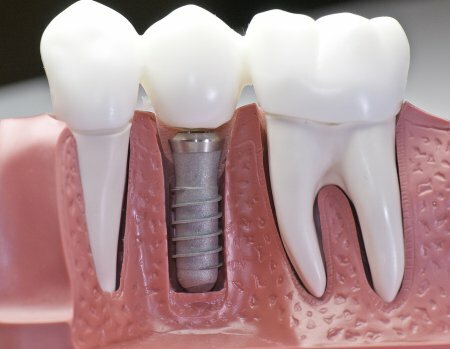 Titanium posts are used to create the base of the implant, and a crown that is designed to match patients’ natural teeth is used for the top of the implant. No special care or dietary changes are required, which makes implants a favorite with patients over dentures. If you have missing teeth, let Glenwood Premier Dental help you reclaim your smile with implant dentistry near Hazlet . To schedule a consultation or to learn more about our dental implant services, please call (732) 264-4477.